Is it possible to have URL action on categories which will redirect user to different web page? Yes we can do that. you can use actions and URL from that. 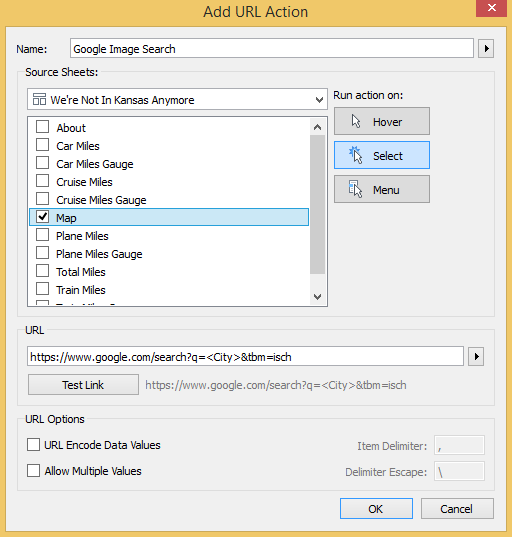 In the Actions dialog box, click Add Action and then select URL. Select the fields you want to use for highlighting. You have given static link (www.supplier1.com) so this will always go to the same link , instead of that have a filed with values like supplier1,supplier2,supplier3 .... for each company and let say this field name is urlname. Then use this field in URL like below. So the idea here is to insert the filed name into URL so that it will be dynamic and go to different links based on that value. Yes it is correct , as above HIMA VARDHAN said correct, for the more information about this idea please go through the below link and information. The dashboard action should be a URL action. You can refine the settings to have the action run on Hover, Select, or Menu; I have chosen for the action to run on Select (which is the same as click). Lastly, for the URL, paste the URL that you recorded from the search above. Replace the portion of the URL for the query, which is the text immediately following the “?q=”, with a field from your data. You can add a field from your data source by clicking the arrow that appears next to the empty URL box. I wanted to run a search for each city, so I used the field <City> from my data source. Now if I click a place on my map, a Google Image search is executed with the name of that city (from my underlying data) as the search query!